Can Someone Please Make Goal Setting Easy for Me? Think goal setting is hard? Well it’s not. The actual goal setting part is easy and fun. It’s setting aside the time to do it that is difficult. We’d much rather sit on “input mode” in front of the TV or internet because that doesn’t require much thinking. Well if you are yearning for something better in your life right now, do yourself a favor and use this simple guide and free Life Goals and Values Worksheet to discover your values, establish your goals, and craft your action plan to get there. Did you know that only 3% of people in the US set goals, and that they are among the wealthiest folks in the nation?! If you want to accomplish something, you can do it! But you must know where you want to go, have a plan to get there, and monitor your progress along the way. I have created a very easy to use excel spreadsheet template to uncover your values, establish your goals, and craft your action plans for each goal. I will keep this as simple and streamlined as possible. Please download the template before starting. If you want to set your goals very fast, you can skip this part and go to the “Life Goals” heading below. If you want a compass to guide your goal setting then, read this part. Values are our inner guides that tell us how to live our lives. They help us make the most of our most valuable resource, time. They keep us from becoming caught up in distractions that steal our time away from what we really want. In short, they help us live our best life possible. Go to the “List of Values” tab in the LifeGoals spreadsheet. Either print for offline viewing or read it online. Highlight the ones that resonate with how you want your life to be. You may add ones to this list or define them more specifically. Try to get this down to 10-20 values by merging similar ones or eliminating ones that are not as important. Write out your top 10-20 on yellow sticky notes for prioritizing. Prioritize these by continually comparing them two at a time until you have them in order. Place an (x) under each of the categories that those values apply too. See the examples you have questions on how it should look. Here’s the fun stuff. What if I told you you can have just about anything you want? Well you can! The real “secret” of this life is that you can achieve anything to which you set your mind. Here’s the magic formula: you must pick your destination, plot your course, execute your plan consistently over time, and monitor your progress, adjusting as necessary. Most of us are doing a lot of this on the fly and that’s fine. However if you want big changes that are important to you, this process will keep you more focused and more likely to succeed. Fill in your goals in the different categories (career, relationships, financial, physical, etc.). Don’t feel like you have to fill them all in at once. 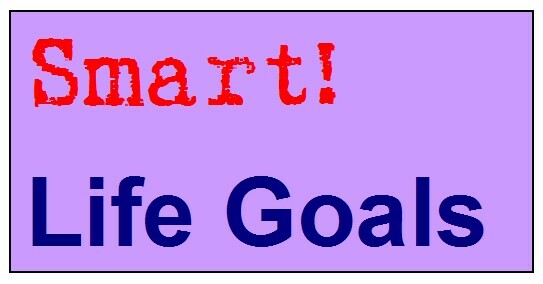 Fill in the SMART criteria for each goal: Specific, Measurable, Achievable, Relevant, and Timebound. Each one is explained on the sheet. This can be done either online or printout the sheet. To fill out on paper, print out as many templates as the number of goals you have. Fill in the Category and Goal. Optional: Fill in the Values from “Your Values” tab that align with this goal. If none of your values align, this could be a red flag that either this goal is not right for you, or that you’re missing a value that is important to you. 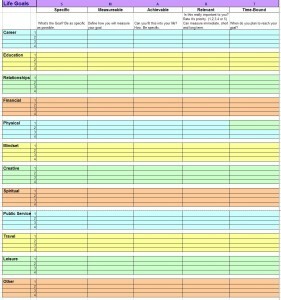 Fill out an “Action Plan Template” for each goal you have. Include all the steps. Be really specific and detailed. Include Due date if appropriate. Add action steps into your calendar. Check off Actions as they are completed. Your current calendar. A great one is Google Calendar. Online or offline, schedule your action steps and fill in habits achieved each day. Online tracker: JoesGoals.com is a great way to track those goals that involve a daily or recurring actions. Very easy to use. The “Progress Calendar” Tab in the LifeGoals worksheet. You can use this for success charts which I will cover in another post soon. When setting your goals, allow yourself to dream big. Don’t worry about past attempts. Today is a new day. The future is yours to shape! Everyday visualize yourself achieving your goal. Believe! You Can Do It! When tackling your goals and setting your action plan, take it slow. Apply the Rule of One, which says to start only one goal at a time for the most success. Don’t be in a rush. Slow and steady wins the race. Get a Goal Buddy or more than one to help spur each other on with your goals. Make sure that your goals are YOURS, not someone else’s idea of what your goals should be. Goal setting is the easy part. Doing the action steps and monitoring your progress is where the real work is. Be persistent and methodical. Slow and steady wins the race! You goals may morph over time. Adapt your goal list and action plan accordingly! If traditional goal setting is not for you then just use this loosely to whatever extent you can. Remember Action Creates Energy so get started now no matter how you feel and watch your enthusiasm grow! Goals On Track – very cool online goal software. “an easy to use, web 2.0 style goal setting, goal tracking, task and time management software that helps you accomplish any goals in life.” It is a pay service, but it’s got a 100% money back guarantee. Hey, if it helps you reach your goals, especially financial ones, it will probably pay for itself many times over. Please share your comments on Goal Setting and Personal Values. All comments big and small are very welcomed! If you found this post valuable, please SHARE THIS below with aÂ Stumble or Delicious bookmark. Votes are always appreciated! great post! just what I need to make 2011 an awesome year. @Tosin – Awesome! Thanks! Wishing you success! I’ll recommend this to the people that I help quit smoking. I will right away grasp your rss as I can not to find your e-mail subscription link or e-newsletter service. Do you’ve any? Kindly let me know in order that I may subscribe. Thanks. Bryce, you can subscribe in the upper right hand corner of my sidebar. Thanks! Goal setting is a great tool so that you can focus on what you want. Also using the law of attraction with goalsetting can be extremely powerful recognising that it’s not just the process of goalsetting that will get you to your end result but how you feel about your goal. Does it feel good can you visualise it as being already done. This will help you immensely in creating the life that you want.